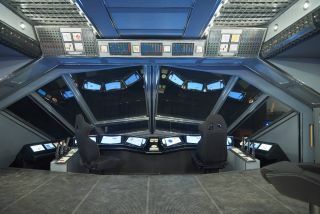 The "Killjoys" ship Lucy's cockpit was designed with realistic reflections in mind, making the computer-generated views outside its windows more believable. The front can roll off for filming, though. Space.com dropped by the set of the Syfy adventure series "Killjoys" in February, where the cast and crew were busy filming the show's second season. Over the course of our visit, we learned a lot about the personalities of ships and planets, future space fashion and what's in store for Season 2. Upon first walking into the Royale bar set, where actors came to talk wit the press, visitors were presented with walls of character costumes. 1. Futuristic fashion has high necks, buckles. Trisha Baker, the costume designer for "Killjoys" Seasons 1 and 2, was tasked with creating a distinctive futuristic look for the denizens of the "Quad" — the dwarf planet and three moons that make up the show's setting. A lot of that process was just making something look different, such as replacing buttons and zippers with clasps and buckles. "I don't know what [fashion] is going to be 600 years in the future in another galaxy, so all we can do is make it look a little bit different to the eye," Baker said during the set visit. Each of the three main bounty hunters has his or her own signature colors, tailored to what looks good on the actor — and for Season 2, the costume colors overall will get much bolder and more vibrant. But they'll still have the familiar clasps and buckles, asymmetry, and high-necked silhouettes, Baker said. "The high neck looks good, because both of my boys are very long-necked, graceful, as is my lead actress," Baker said. "Those high necks — the tubes are good on all the characters. We do that — that's our space look." The inside of the Royale looks worse for the wear post-Season 1. 2. You'll see a lot more of Pree and Alvis. And in the case of Pree, viewers will quite literally see more of him. "I get to come out of the bar for a moment, because of the nature of what's happened," Allison said. "You get to see me from the bottom down, which is nice." Outside the Royale, looking very different after the events of Season 1. The crew moved this entire set to a new studio between seasons. 3. Each world has its own theme. Crossing through the set brings viewers through a grassy, idyllic monastery on Lethe, a strange, modern headquarters on Westerly and other, more alien locations. The show's production designer, Andrew Stearn, described the thought that goes into setting each of the different locations in the Quad apart from one another, so that they stay distinct as the characters move from one site to the next. "Each planet is different, and you have to delineate it," Stearn said. "You go to Westerly, and all of a sudden, there's no trees and no wood and no paper on the planet. So you can't have any furniture made out of wood; you start to get restrictions from that kind of stuff. And [Lethe] — it's great to be on a beautiful green planet, but when [you're filming in] winter, it's a tough one to fulfill." Khlyen's ship is segmented, so different parts of the ship can all be filmed in this one segment. 4. The ships reflect their owners' personalities. In Season 2, viewers will get to see Khlyen's ship, which is much different from Lucy, the ship on which the Killjoys spend most of their time. It's monochromatic, clean and shiny, to better reflect the demeanor of the mysterious mentor/villain figure. Lucy, on the other hand, has the air of a flying boat, or a stolen item — and that component of the ship's personality was actually developed before the artificial intelligence voice that comes with it. "We designed Lucy before the voice had appeared, or had been cast yet," Stearn said. "The personality of her — I think we always knew right from the start that she would have that personality. [Michelle Lovretta, the showrunner,] definitely wanted the ship to not be a very sharp-edged, 'Star Wars' kind of ship. She wanted to have much more organic-looking qualities." This monastery on Lethe is a repurposed set: It's an idyllic setting now, but it used to be a Westerly prison during Season 1. 5. The cast wants a musical episode. "We're very close — we sing all day," said John-Kamen, who plays Dutch. She and others have devised songs for many of the show's locations, and they look forward to a musical episode — well, maybe someday. "It's a really, really musical group," said Allison, who's a Broadway performer. "I mean, have you ever heard Luke [Macfarlane, who plays D'Avin] sing? Killer. Everyone chortles away; it's fun. Accents and songs, "Monty Python" — it's a kooky, fun energy on set for sure." And Allison, at least, thinks Lovretta could work in such an episode, as implausible as it might sound. "She's smart about how she does it," Allison said. "She [Lovretta] finds ways. I'm actually shocked how she works things in. I go, 'You clever minx.'" An important new headquarters on Westerly has holographic views of Lethe's forest in place of windows. The same segment of the set can be repurposed as a hallway, offices and more. 6. The Season 2 premiere is going to be epic. Rob Stewart, who plays Khlyen, can't wait for people to see the very beginning of Season 2. The first episode of Season 2 is "the best 60-minute script I've ever had the pleasure of being a part of," he said. "When we did the read-through, I was like at a rock concert. Like 'Aaaah, that's the greatest!' It was so much energy." 7 (Bonus): Walking (and sitting) on a sci-fi flight deck is awesome. Now, if only I can figure out how to start this thing.